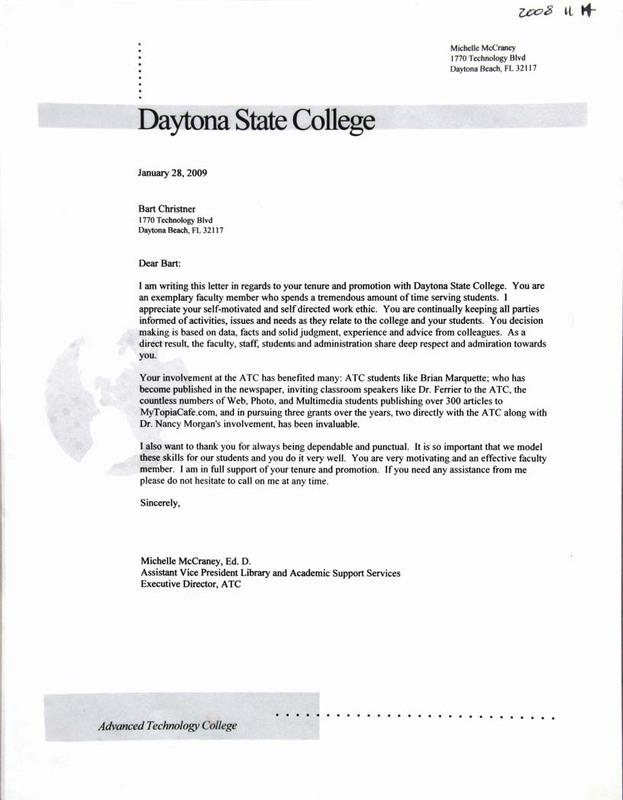 I am writing this letter in regards to your tenure and promotion with Daytona State College. You are an exemplary faculty member who spends a tremendous amount of time serving students. I appreciate your self-motivated and self directed work ethic. You are continually keeping all parties informed of activities, issues and needs as they relate to the college and your students. You decision making is based on data, facts and solid judgment, experience and advice from colleagues. As a direct result, the faculty, staff, students and administration share deep respect and admiration towards you. Your involvement at the ATC has benefited many: ATC students like Brian Marquette; who has become published in the newspaper, inviting classroom speakers like Dr. Ferrier to the ATC, the countless numbers of Web, Photo, and Multimedia students publishing over 300 articles to MyTopiaCafe.com, and in pursuing three grants over the years, two directly with the ATC along with Dr. Nancy Morgan's involvement, has been invaluable. I also want to thank you for always being dependable and punctual. It is so important that we model these skills for our students and you do it very well. You are very motivating and an effective faculty member. I am in full support of your tenure and promotion. If you need any assistance from me please do not hesitate to call on me at any time.